Connection between employees and with employees is THE crucial element of corporate creation and efficiency. Horses can help us to better connect. Some thoughts and reflections about these two statements. Commitment to the job, the team, the company. Motivation, goal setting, team work, 360, leadership. We know these terms all too well. However, more often than not they just don’t seem to work so well. Why? Because there’s something missing: connection! The very essence of human life is connection with other humans. Neuroscience today knows and can prove that humans suffer and even become physically or mentally ill when they are deprived of connection with other humans. Neuroscience can also prove that humans actually thrive when deeply connected to other humans (or animals). Connection can be described as a process between 2 or more people that thrives on conversations/situations of mutual respect, awareness and understanding. It triggers the hormone oxytocin in our brain causing our cells to engage in strengthening and even healing activities. It also makes us feel and think as WE. Excellent leaders and teams think in categories like ‘WE are”, “WE will’, ‘WE can”. They act in connection with others and sometimes even in sync. They engage in the highest possible level of conversation: Co-Creation (Judith E. Glaser: Conversational Intelligence). You all know the feeling of being deeply connected with another person. It can happen e.g. during a discussion when you somehow feel a flow in the conversation. You say something and –as if your partner could read your mind – your words are getting completed, developed and carried forward by the other persons’ contribution. Ideas thrive and visions are born. Judith points out that the ability to co-create is hard-wired into every human being. Our pre-frontal cortex, also called the ‘executive brain’ carries this precious ability. How does our connection ability get activated? How do we actually start co-creating? The magic key is to feel enough WE which results in trust , which results in co-creation. The lack of WE, TRUST and CO-CREATION is a major reason for ineffective leadership such as not delegating enough, not listening, instructing without engaging the team etc. The WE- attitude is created in our right brain. Its main function is to encompass us to be in the here and now, in the present moment. If the right brain is not engaged, we think and behave from a perspective of ‘I’ , separating us from our context and our environment. If the left brain is not engaged, we’d melt into our environment, losing our ego. Jill Bolte Taylor, neuroscientist and brain researcher, describes very impressively what happened to her during a stroke that affected her left-brain hemisphere (https://www.ted.com/speakers/jill_bolte_taylor). Left and right brain ideally engage simultaneously in our day-to-day life. This would help us to logically process information, make good decisions and connect to our peers. Right: this present moment, pictures, learns through movement of our body, multi-sensual learning and connection to the environment, the universe even. WE are! Left: linear and methodical thinking about past and future. Categorizes info from the present by experience and projects into the future. ‘I am’ (separate from all others). What a pity. Uneven engagement of both hemispheres means sub-optimal use of our potential and specifically, it means not enough WE, not enough TRUST and not enough CO-CREATION. In this very moment of ‘no solution’, I regularly observe a moment of helplessness eventually followed by a change, a shift in our clients’ behavior. The client starts experimenting with new ways of communication. The client very often becomes so engaged in finding a connection with the horse that he/she forgets about everything else. 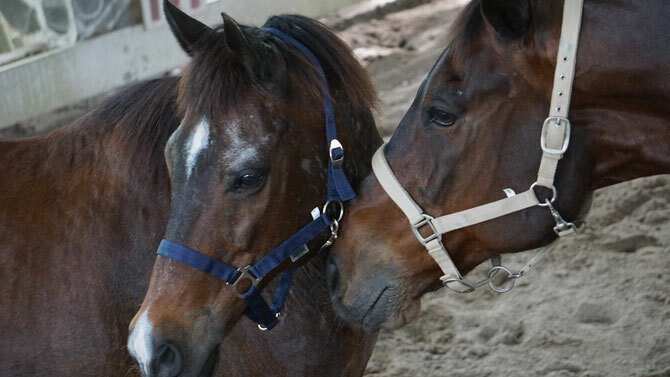 When the connection eventually happens, the client and the horse become a team, clearly relieved and eager to stay connected. This integral learning and leading experience for the human is extremely powerful and long-lasting. Built on this very first connection, the client and the horse then can start to experiment with different leadership styles and challenges like authority, nearness, motivation, diverse teams etc. We videotape all exercises so that the client can watch and reflect his/her action in a coaching debriefing after the session. While watching the video, the client immediately identifies certain behavior he/she also uses in work-/life situations and easily concludes what works and what doesn’t. These conclusions are very valuable anchor points for further self-development. Horse-assisted leadership training and self-development can help us to better connect with others and ourselves. It practices our ability to communicate efficiently, be it verbal or non-verbal.